Sunrisers Hyderabad 3-131 (Shikhar Dhawan 59, Parthiv Patel 23, Jean-Paul Duminy 20, Imran Khalid 2-14) beat Faisalabad Wolves 5-127 (Misbah-ul-Haq 56*, Ammar Mahmood 31, Karan Sharma 1-1, Amit Mishra 1-13) by seven wickets. Shikhar Dhawan blasted another fifty in the consecutive game of the CLTwenty20 as Sunrisers Hyderabad clinched an important encounter vs. Faisalabad Wolves. Faisalabad Wolves managed 127 runs after losing half of their side in the allocated 20 overs and Sunrisers Hyderabad hammered 131 with seven wickets in hand and 15 balls remaining. Amit Mishra (Sunrisers Hyderabad) was announced ‘Player of the match’ for his economical bowling spell of 4-1-13-1. The fourth qualifying match of the Champions League Twenty20 was held on Wednesday, September 18, 2013. Earlier, Shikhar Dhawan, the skipper of Sunrisers Hyderabad, won the toss and preferred to field. The innings of Faisalabad Wolves was opened by Ammar Mahmood and Ali Waqas in a cautious manner by scoring 15 runs in three overs. They added 10 runs in the 4th one with a couple of fours and Ammar Mahmood hit two consecutive fours in the next one. Ali Waqas lost his wicket at 48 in 7.2 overs after contributing 16 runs. The second wicket went down two runs later as their captain, Misbah-ul-Haq appeared in the park and hit the first six in the 11th over. Ammar Mahmood was caught by Amit Mishra off Darren Sammy for 31 off 38 with 4 fours. The middle order batting of Faisalabad Wolves was unable to impress and the entire burden of scoring runs was taken by Misbah-ul-Haq. He dispatched 4 towering sixes and 1 four at the end of the 19th over and smashed his seventh Twenty20 fifty with another six. Misbah-ul-Haq stood firm at his end for 56 off 40 mere balls with 5 giant sixes and 1 four as Faisalabad Wolves reached 127 for the loss of five wickets in 20 overs. Ishant Sharma, Thisara Perera, Amit Mishra, Karan Sharma and Darren Sammy shared one wicket each. Parthiv Patel along with Shikhar Dhawan got off to a reasonable start by scoring 27 runs in four overs. Dhawan hit two back to back fours in the following one and the duo added another three boundaries in the coming overs. The first wicket association was dislodged at 68 in 8.5 overs when Patel was caught by Khurram Shehzad off Ehsan Adil for 23. Jean-Paul Duminy got in next and the batsmen were unable to hit a boundary in the next three overs. Shikhar Dhawan attained his 20th Twenty20 half century on the second delivery of the 15th over and hit a six on the next delivery. He was clean bowled by Imran Khalid for 59 off 50 with 1 six and 6 fours and Biplab Samantray was declared leg before wicket for a duck two balls later. Darren Sammy hit three continuous fours in the 17th over and achieved the target for his team. 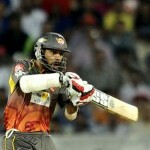 He remained unbeaten for 15, Duminy was at the other end at 20 as Sunrisers Hyderabad piled up 3-131 in 17.3 overs. Imran Khalid was the top wicket taker with two whereas Ehsan Adil chipped in with one. Sunrisers Hyderabad grabbed the game by a big margin of seven wickets and secured 8 points from two outings.